Ido Harari is a PhD candidate at the Department of Jewish Thought in Ben Gurion University of the Negev (writing under joint supervision of Prof. Boas Huss and Prof. Amnon Raz-Krakotzkin). His research interests include Jewish Orthodoxy in Europe (Hassidism, Lithuanian Mussar movement and German Orthodoxy), religious conversion, Secularism and its critique, and the various interactions between Judaism, Islam and Christianity in Modern Europe and the Middle East. 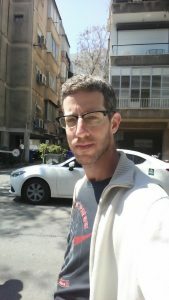 He has been a fellow at Daat Hamakom I-CORE Center for the Study of Cultures of Place in the Modern Jewish World in the Hebrew University in Jerusalem (2015-16), at the Institute for Critical Social Inquiry of the New School for Social Research in New York (summer of 2015), and at the Human Rights and Judaism program at the Israel Democracy Institute (2013-16), in addition to the Leo Baeck Fellowship. My doctoral research is an attempt to examine the different ways in which orthodoxization processes of Jews in the German/West-European Kulturraum, during the late 19th-early 20th centuries, were conceptualized, enabled, and carried out. This work is being done through the close examination of the writings and life-trajectories of four specific figures: Nathan Birnbaum (1864, Vienna-1937, Scheveningen), Jiří (Mordechai Gerogo) Langer (1894, Prague-1943, Tel Aviv), Jacob Israël de Haan (1881, Smilde-1924, Jerusalem), and Leopold Weiss/Muhammad Asad (1900, Lemberg/Lvov-1992, Granada). Three of them became Haredi (Ultra-Orthodox) Jews. The fourth – Asad – became a Muslim. All four figures were raised in Jewish families during the second half of the 19th or the beginning of the 20th centuries; all held, at some point in their early lives, non-observant identities and ways of conduct while based in western-central Europe; and all embraced, sometime in their later life, orthodox religion in faith, practice and visibility – an embrace that was in all cases accompanied by a certain “turn eastward”. Their religious change corresponded with a close acquaintance with the lives and beliefs of East-European Jews (in the cases of Birnbaum & Langer), Middle-Eastern Arabs & Muslims (Asad), or both (de Haan). Concurrently, they all developed well-formulized concepts of “east” and “west”, while identifying themselves with “the religious east” and utilizing the distinction between the two in order to critically look back at “the secularized west”. Based on historical research, on biographical research and on a postcolonial theoretical framework, the main question driving my work is the attempt to understand how Jews raised into West-European culture adopted identities so dramatically different, perhaps opposite, of the ones offered to them by secularized Christian Europe. I contend that the changes they went through are not “religious” changes alone (“religion” being understood in its modern sense, as a private realm separated from the secularized social realm); that is, they cannot be reduced to a personal event, an “experience” (Erlebnis) or a “revelation”, but are inseparably bound with thinking about the cultural-political space in which they were living and with the development of critical approaches toward it. My research attempts to examine their political, cultural, religious and geographic moves in a way that considers them together, and at the same time remains sensitive to the inevitable dialectic of such changes and reflections; in other words, I am trying to understand not only why and how the people I am studying moved eastward, but also what they took along with them from the West and the tensions aroused by these translations. As part of this examination I am trying to look closely at the concepts of east and west in their writings and at the social, political and religious contexts of the development of these concepts, alongside other concepts utilized by them such as “Europe”, “Conversion”, “Secularism” and “Religion”. In very different ways, each one of the four figures I am studying has situated himself between the lands of European Enlightenment and those distanced from it, while being already “Enlightened” and still – as Jews – the “orientals” of Europe. Their struggle to move away from Europe while always remaining ambivalently tied to it is what stands at the root of my work. ‘Ashkenazi Arabs? – Proximity and Separation in the “Old Yeshuv” of Jerusalem’, Zmanim – A Historical Quarterly (135; January 2017), pp. 22-33 [Hebrew]. ‘A Hassidic Leadership of Suffering – R. Aharon of Belz, “Der Belzer Rov“‘, The Gdoilim – the Figures that Shaped the Face of Haredi Jewry, Benjamin Brown & Nissim Leon (eds. ), Magnes & Van Leer, Jerusalem 2017, pp. 520-549 [Hebrew]. ‘”The Arab clothes of our forefathers”: articulating Palestinian Jewish identity through clothes and language’, Contemporanea – XIXth and XXth Century History Review (forthcoming 2017) [English].